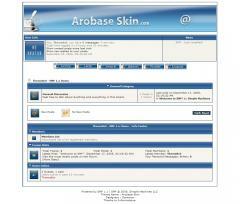 This theme is called Arobase. It is a cool looking and Professional theme for SMF. Its also easy going on eyes. I have added onmouseover effects for Forms (Buttons, Text Area etc..). and in this theme however wide the screen resolution maybe, the logo would fit well. The right part of the logo is made to repeat to fit the screen.